FoodThoughtsOfaChefWannabe: Roasted Leg of Lamb, Simmerman style. Roasted Leg of Lamb, Simmerman style. Can I tell how much I dislike lpreparing lamb? I don't dislike it, if I don't have to cook it. But let me explain why I can't eat it if I have prepared it. The texture of the skin on a leg of lamb, feel much like cutting human skin to me. OK. Gross, I know. But, has that ever stopped me before? I seriously can't believe I just wrote that, but, my bigger concern is you all wondering how I know what cutting human flesh is like. (if you could hear how hard I am laughing, I think out of nervousness). I just can't prepare it, and then have to eat it. I will eat it from a restaurant, no problem. 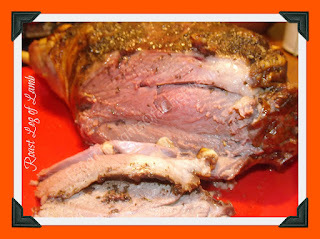 But there are a few other misconceptions about lamb I want to set straight. Well, according to me anyway. You can prepare this lamb as per the directions, put it in a large Ziploc or cover tightly and let sit in your fridge for up to 24 hours. I did not marinate mine, and it was still incredible. So if you are a "do ahead" kinda person, you have the option. Purchase a leg of lamb, bone IN as big or small as you need it. Lamb is expensive right now. I happened to hit a 50% off sale using my member card at this grocery store I loathe. That is an entirely different blog. Cover with foil, and roast until your internal temp is 140-150. We like ours pretty med-rare so I roasted it to 140 degrees. Perfection. It took approx 2.5 hours for a 7 lb leg of lamb but make sure to use your meat thermometer, that is the only way to make sure it is cooked to a safe, and preferred temperature! I removed my foil about 30 minutes before I took it out. Let it rest a good 15-20 minutes before slicing! You are ON like Donkey Kong!